Watch our instructional videos to learn or refresh your skills on biomonitoring in WNC streams. Once you've done that, test your skills with our biomonitoring quiz. Thanks to PIGEON RIVER FUND for its generous support in making this online training possible. Note: In 2017, the SMIE program split out 3 different taxa (striped net spinner caddisfly, finger net caddis, and two-tailed flattened scraper mayfly). See updated training materials for details. 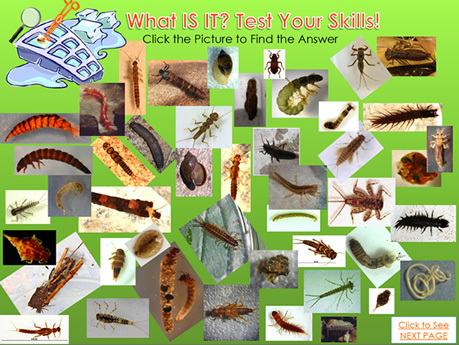 Biomonitoring Quiz - "Test Your Skills"
Note: This interactive quiz only works with Firefox and Internet Explorer.